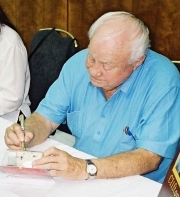 I met Clifton James at Autographica in London, in October 2005. He signed a lovely photo of 'Sheriff Pepper' for me, and also two of my Corgi Models. 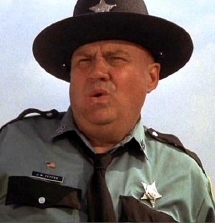 To say that Clifton James is typecast is an understatement! Most of his film roles are pretty much the same, as for example, in Superman II (1980) when he again plays a carbon copy of Sheriff Pepper, although his character is not actually named, either in the film or in the credits. 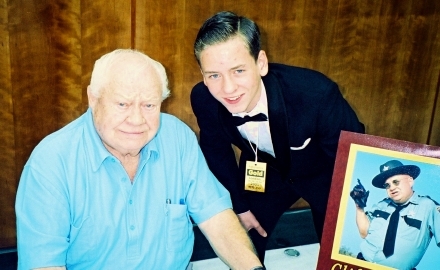 Clifton James' most recent film appearance was in the comedy Raising Flagg (2006). Sheriff Pepper turns up again when least expected, in The Man With The Golden Gun (1974). This time he is in Thailand on holiday, and unwittingly becomes involved in a high-speed car chase as a passenger in Bond's car. The off-duty Sheriff even gets arrested by the Thai authorities! 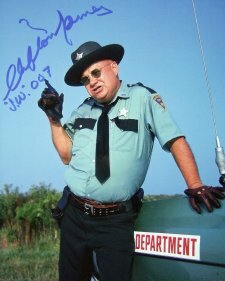 Clifton James has specialised in playing southern, redneck sheriffs, and the most famous of these is Sheriff J W Pepper who first appears in the James Bond film Live And Let Die (1973). This disaster-prone, tobacco-spitting, Louisiana police officer is the height of rudeness and incompetence. 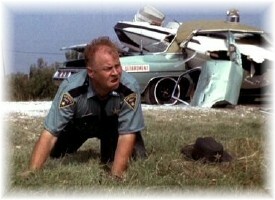 He tries to arrest Bond for his part in the boat chase which left the sheriff with a wrecked police car. Clifton James (not to be confused with American actor M E Clifton James) was born in New York, although from most of the characters he has played you would think he comes from the Deep South, so well has he mastered that accent. Clifton James died on 15th April 2017 aged 96.